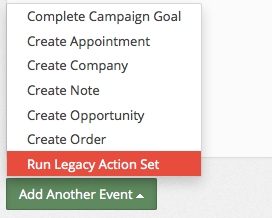 The Run Legacy Action Set feature is a great tool because it allows you to run many actions on a contact record, including, but not limited to: applying a tag, starting a campaign, assigning an owner, etc. Select Run Legacy Action Set from the Add Another Event Dropdown. To select your desired action set, all you have to do is start typing the name of the action set and select it from the dropdown menu when it appears. Once you have your Action Set selected hit Save Action Set. You're done!